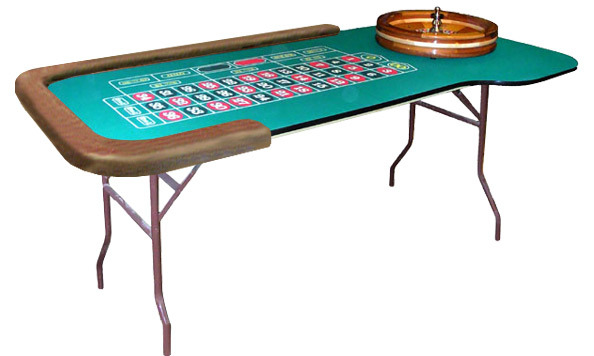 These Seven Foot Folding Roulette Tables feature a casino quality synthetic layout and sturdy folding metal legs. We also offer a full selection of Roulette Supplies and Accessories. The Roulette Table accommodates up to a 22-inch diameter Roulette Wheel. Please visit our Roulette Wheels page for more information (roulette wheels are sold separately from our roulette tables). Our Folding Leg Roulette Table is great for casino night companies, clubs and organizations, special events, and more. Folding Roulette Tables - Perfect for Club Use and Fundraisers - New Lower Pricing! This sturdy, handsome Folding Roulette Table (#ROU-PORT1) is crafted in the U.S.A. from solid oak wood. The table measures 96"L x 36"H. Each Break-Down Roulette Table features a casino-quality layout with a padded armrest. (We also offer a full selection of Roulette Supplies and Accessories). Our Folding Roulette Table is perfect for casino night companies as well as organizations and individuals who require a quality table for occasional play that can be easily stored when not in use. Our Folding Roulette Tables are available with your choice of layout color (blue, burgundy, or green) and armrest color (black or dark red). Please specify your preferred colors when you place your order. For additional information on our Folding/Collapsible Roulette Tables, please contact us at 1-800-233-0828. You might also be interested in browsing our full line of Roulette Supplies and Accessories.